Founders Hall (left), which is still in use today, and the first campus building (right) at Mars Hill University, are seen in this photo from the 1890s. 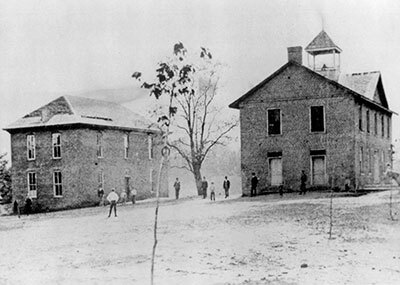 Founders Hall (left), which is still in use today, and the first campus building (right) at Mars Hill University, are seen in this photo from the 1890s. Mars Hill University was founded as the French Broad Baptist Institute in Madison County in 1856, in the days leading up to the Civil War. Shortly thereafter, the name was changed to Mars Hill College, inspired by Acts 17:22, which said, “Then Paul stood in the midst of Mars’ hill and said, ‘Ye men of Athens, I perceive that in all things ye are too superstitious.’” The college was chartered by the State of North Carolina in 1859 following its founding by some dedicated but struggling local families who wanted their children educated and instructed in the Baptist faith. The devastation of the Civil War in the mountains of North Carolina continued long after the end of fighting, because families were split over whether to fight for the Northern army or the Confederate army. Ill will among families and neighbors had a negative impact on Mars Hill College until almost the 20th Century. A succession of short-termed college presidents struggled to keep the college going. A turning point was reached in 1897 when Dr. Robert L. Moore became president and launched a period of stability. His personal faith and integrity became widely known and attracted students whose parents wanted them to come under the influence of such an inspirational leader. Dr. Hoyt Blackwell was elected in 1938 to replace Dr. Moore, and led a period of building and progress leading to the conversion of Mars Hill to four-year status in 1962. Mars Hill had become one of the premiere two-year private colleges in the nation, and the next challenge became attaining that recognition for the four-year institution. The Blackwell era was followed by the election of Dr. Fred Bentley in 1966. At the time, Bentley was perhaps the youngest president of a senior college in the nation. Bentley presided over a period of dramatic change, paralleling in some ways the changes that were taking place in the nation. Mars Hill College expanded its outreach programs and identified itself more closely with the Appalachian region. After 30 years in office, Bentley retired in 1996 and was followed by Dr. Max Lennon, an alumnus (class of 1960) and former president of Clemson University. Lennon resigned in January 2002 to head a program in technology and technology transfer to bring the communities of Western North Carolina the advantages of high speed computing and Internet access. Dan G. Lunsford, an alumnus (class of 1969) and Dean of the School of Education at Mars Hill College, was named interim president in January 2002 and elected to the presidency in May 2003. His presidency has been marked by improved morale on the campus, progress in building enrollments, success in fund-raising, and creating a vision for a brighter future. In 2011 the college added a master’s degree program in education, which saw its first graduates in 2013.